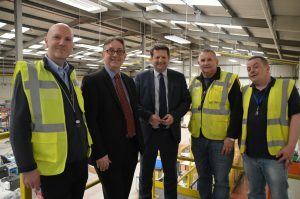 E-Cycle’s Paul Sinnott and Wayne Roberts welcomed the Cabinet Secretary for Local Government and local Assembly Member Mick Antoniw to their Tonyrefail site on Monday to show-case the business’s cutting edge digital services. The Cabinet Secretary was visiting as part of the Valley Taskforce initiative, which is focused on increasing economic activity in valleys communities. E-cycle, which employs many former Remploy workers, has been supported by the Welsh Government through a number of grants and most recently were awarded a £127,000 innovation grant. “E-cycle is a shining example of what we want to see more of in Wales. It’s an ethical employer operating in a high-tech industry and it is excellent news that the Welsh Government has decided to continue to support the company as it grows and reaches into new markets. “It was great to welcome the Minister today and for him to take such an interest in our expanding business.